Bulgogi is marinated thinly sliced beef dish, one of the popular Korean foods. Beef should be tender and melting in your mouth. Basic marinade is soy sauce, garlic, ginger, chilli, onion and sesame oil, but everyone has their own twist on the marinade in Korea that makes the Bulgogi flavour different from house to house. My mum’s secret weapon is using purée of acidic fruits which breaks down meat protein and therefore makes it tender when cooked. It also helps to balance sweet and sour. Normally kiwi fruit, Asian nashi pear, apple or pineapple works well. You need to make sure you don’t leave meat in the marinade too long otherwise it will end up all mushy. I don’t usually cook lamb because of strong smell of it, but this lamb Bulgogi was not too bad actually. I’m surprised it tasted as nice and tender as traditional beef Bulgogi. To make Bulgogi you need thin slices of meat either beef or lamb. If you cannot find in the supermarket, go down to your local friendly butcher. They can help you with that. Marinade meat for an hour or two. Cook in a frying pan in high heat. It’s thin marinated meat so shouldn’t take long to cook. My tip is not to crowd the pan otherwise temperature drops down and the beautiful juice all comes out of the meat. Quickly stir-fry and serve with sesame seeds on top. 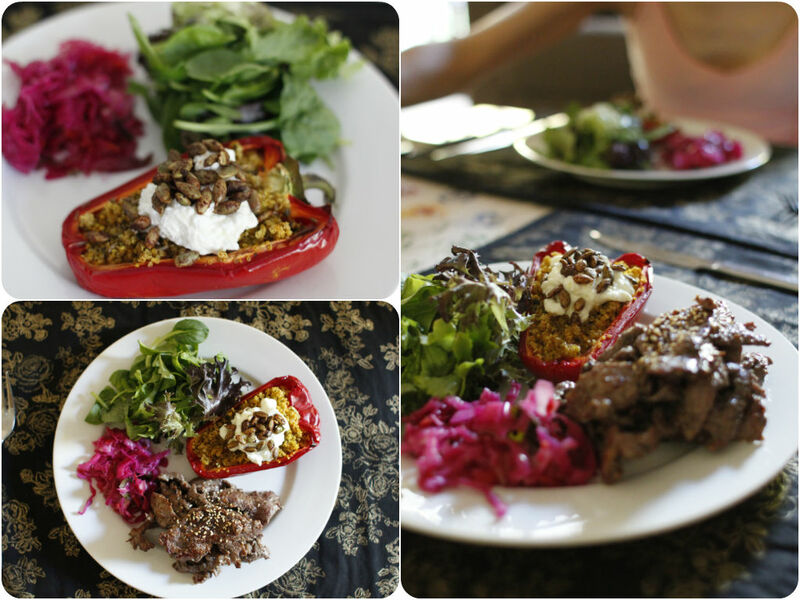 I served Bulgogi with a stuffed capsicum and red cabbage sauerkraut. I cooked half cup of quinoa with turmeric and mint first. Then put it in the halved red capsicum and cook in the preheated oven (180) for 20 minutes until capsicum is tender. I topped with cottage cheese and roasted pepitas. It was very tasty and well-balanced flavours – sweetness from roasted capsicum, nuttiness from quinoa and pepitas, and creaminess from cottage cheese. Delicieux!